Whether you want to learn the basics of sailing or just want to improve on the skills you’ve already honed in your home waters, why not include a sailing certification course on your own private yacht with your own private instructor? 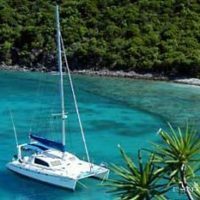 It’s still an all-inclusive charter but, in addition, your captain is a certified sailing instructor with either US Sailing or American Sailing Association (ASA). You will improve your skills and gain the confidence to be your own captain. In addition, since you are on board the entire time, you will gain insight into the world of cruising which you would not get if you were taking the same course from a shore-based school. Remember, there will still be time for relaxation and fun! Jet Stream, a Leopard 45 catamaran, has 3 Queen cabins with ensuite heads with electric toilets and wet showers and is air -conditioned throughout. For movie night, there is a large screen for the cockpit. Capt. 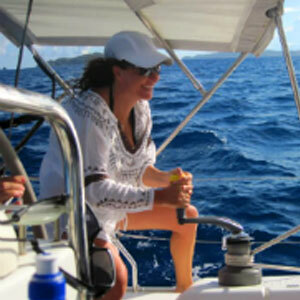 Tim does both fully crewed charters (up to 4 guests) and also captain only charters. 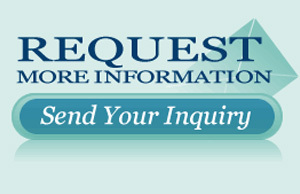 ASA instruction is additional plus cost of books and tests through ASA. 101 Basic Keelboat is done in conjunction with Bitter End Yacht Club, in a monohull, at extra cost. ASA 103, 104, 105, 106 and 114 also offered. Avalanche, a 60 foot Trehard monohull, accommodates 6 guests with a very flexible layout. The Master cabin aft is a spacious Queen. The two forward cabins are twins that can be converted to Queens if needed. All are ensuite and she is fully air-conditioned for your comfort. 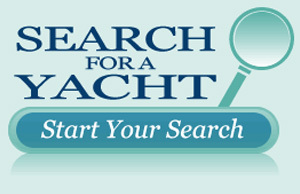 They offer both all inclusive charters and Captain Only charters. ASA 101, ASA 103, ASA 104 and ASA 105 are offered for $115 per student per course plus a $45 one time fee for course materials. Instruction is $200 per day. Mari’s Leonardo, a Fontaine Pajot 44 owner’s version, has the entire starboard hull for a very spacious stateroom for one couple and one portside cabin both with ensuite head/shower. The owner’s head has a separate shower stall. She is air conditioned throughout. This is a Captain Only charter so the rate covers only your exclusive use of the yacht and the captain’s services. All other expenses including food, drinks, cocktails, fuel, water, ice, BVI fees, etc. are additional expenses. You also cook (for your captain too) and clean. The ASA course is 7 days, two of which are on a smaller keel boat for ASA 101. Guests will stay on the yacht for those days.